The addition of Heartbeat Technology™ to the Micropilot FMR5X and FMP5X Levelflex families of level transmitters provides automatic monitoring, diagnostics and verification functions, cutting maintenance costs and eliminating unnecessary calibrations. Endress+Hauser adds Heartbeat Technology to its Micropilot FMR5X free-space radar and FMP5X Levelflex guided radar level transmitters. Heartbeat Technology is an on-board diagnostics and instrument verification system that continuously monitors the status of mechanical, electromechanical and electronic components in the sensor, and sends alerts when it detects a problem. Alerts are sent in accordance with NAMUR recommendation NE 107 and are displayed at the device. Alerts include “Out of specification,” “Maintenance required,” “Device failure” and “Device OK.” The built-in diagnostics can detect process problems, such as build-up or foam before failure occurs. Heartbeat Technology is also able to perform device verification in accordance with requirements of the pharmaceutical, food and beverage, oil & gas, chemical and other industries. Such requirements call for level instruments to be removed and calibrated unless in-situ verification proves the device is operating properly. During verification, Heartbeat Technology compares internal components with their reference values, thereby determining the device status. Verification produces a pass or fail statement, depending on whether the assessment is positive or negative, and generates a verification report in compliance with quality, safety and regulatory requirements, and meeting the needs of agency auditors. Verification information, reports, diagnostics alerts and instrument data can be viewed at the control and monitoring system, or via a web browser running on a PC, tablet or smartphone. Heartbeat Technology reduces the need for calibrations requiring the removal of instruments from the process; reduces the need for maintenance personnel to perform on-site instrument checks; immediately alerts operators when an instrument requires service; and provides diagnostics functions to describe problems so technicians know what they are dealing with before they go to the field. The Micropilot FMR5X series of free-space radar level transmitters provide accuracy up to ±2mm for level measurement of liquids and ±4mm for bulk solids products in the pharmaceutical, food and beverage, oil & gas, chemical and other industries. Multiple FMR5X transmitters can be installed in the same tank without interference among them because the transmitter pulses are statistically coded. FMR5X instruments can be used to measure level or volume with a built-in 32-point strapping table. The liquids can be measured in metal or plastic tanks, stilling wells, bypass chambers or other vessels up to 131 feet high with standard units, or 197 feet with an enhanced dynamics option. The instrument can also be used to detect minimum or maximum levels to prevent overfilling or empty tanks, in addition to continuous monitoring of the level. 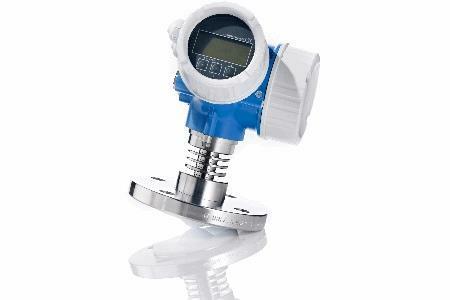 Levelflex guided radar level transmitters are used for continuous level measurement of liquids, pastes and slurries but also for interface measurement. The measurement is not affected by changing media, temperature changes, gas blankets or vapors. Micropilot FMR5X and Levelflex FMP5X transmitters can be loop powered by 4-20mA in a two-wire arrangement, or separately powered in a four-wire configuration. Digital communication options include HART, Profibus PA and Foundation Fieldbus. Optionally, the transmitters are available with two independent, configurable 4-20mA outputs.